How do you check the poly count again? I haven't done it in so long. And yeah, a Lithunwrap video might help. And I see a few differences between the middle and bottom pic... such as the car poster above the bed. But it all looks great! I'm confused... is the middle pic the Disney shot? Both of the bottom 2 are official. the second one is from the trailer, the third one is from the final movie, albeit a bootleg copy (will have to do until it hits blu ray in Nov). and yeah, there are differences, which is why I posted both versions. if you guys spot anything else different, speak up so I can make sure I don't use the work in progress version of the film to base mine off of. I have a lot of posters to replicate so I don't want to waste time recreating ones that are no longer there. some of the stuff will probably have to be original, since I simply can't make out a lot of the smaller ones. but I can at least use the colors for inspiration. and once I can get a clearer shot of the room in HD I can rework some things. Options doesn't have an "info" in scene mode, so I'd have to do some math, as some additional models are in separate objects, but the main room is 72,114 faces. This doesn't include Woody, the guitar, a pencil, and trophy. Why so many bots here these days? We need to upgrade to SMF 2.0. 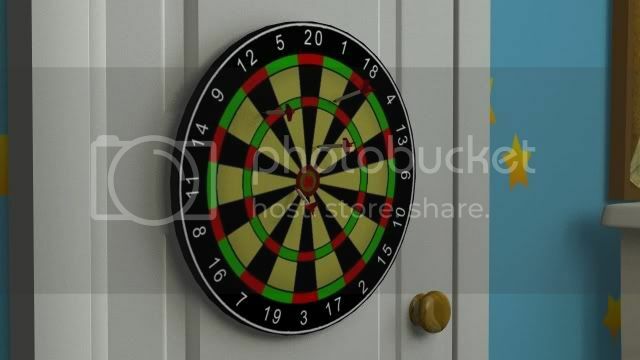 Made a dart board, texture from scratch. I just now noticed I made it too large, will scale it down soon. Made a ton more proportional changes to the overall room, still trying to get things to match more to the ref images. also softened the shadows, their all at 500 softness now. trying to make it look like ambient occlusion without actually doing it. reworked and completed the headboard. I've hid certain flaws before with the pillow, the spokes (for lack of a better term) didn't go all the way down, now they do, so I was able to lower the mattress. It's coming along great, Kyle. Wow! This is in anim8or?! How do you do face expressions? Do you use morphs? Yes, its all Anim8or. For expressions I have to modify the models. Sometimes it's as a morph, other times as a copied object to save the original. Either way, I still have to move points around manually to get the various expressions. 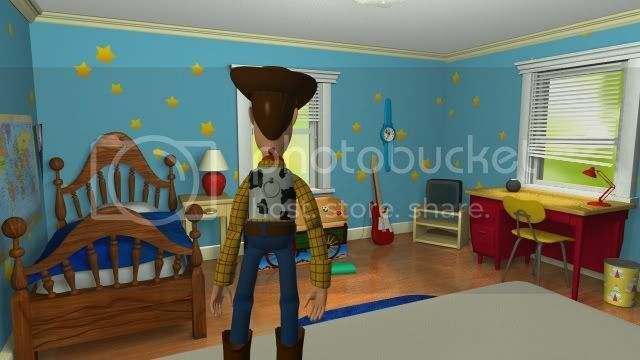 Ive only actually animated Buzz's though. Edit: So I was looking at some of my behind the scenes stuff that I haven't seen in a while, and I realized that they do in fact remove walls and such to put the camera in places it normally couldn't, so I don't feel as bad that I can't match the angle. I might be able to get it to if I remove the fourth wall. They seemed to hide/remove anything they don't need in the camera's view, as if it were a movie set. I bet I could speed up my render times if I did that too. I mean, I do this to an extent, but I don't like to remove whole walls and too much furniture, it can throw off the lighting. I'd like to quote John Lassater if I may. "The art challenges technology. Technology inspires the art." XD I see that spirit here. 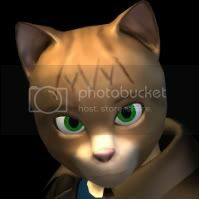 Hey, Kyle, can I borrow some of these images for an anim8or gallery youtube video I'm trying to set up on Youtube? Early work on young Andy. I'm having a hard time getting the refs to line up. the top of the head never matches at the same time as the nose and chin. very frustrating. Looking good. More like excellent. Anyways for that dirty laundery, you want lots of rinkles and some dirt patches. I wouldnt look up tutorials for dirty laundery, I would look up a pitcure (or use your own) and observe the picture very closly. Mainly you would want to put alot into the texture, and shape of the object. A bump map might work for the wrinkles.